Does Back to School = Back to Germs in your house? This is certainly the case in my house and as a Mom I try to do everything I can to minimize the spread of germs and the resulting sickness. As a teacher, I see first hand in the classroom how often kids cough and sneeze and then proceed to touch each other and everything around them. We know that the best way to combat the spreading of germs is hand washing but realistically, it's not always possible to run to a sink and wash with soap and water. This is where Wet Ones comes in and offers a simple, easy to use alternative to hand washing. Our family keeps a canister of Wet Ones Antibacterial Wipes in the car for those on the go messy moments. I can't tell you how many times it has come in handy - rescuing us from spills, sneezes and more. 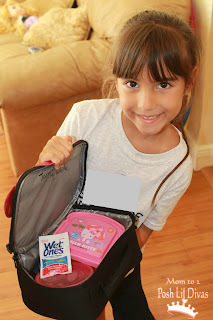 During the school year I make it a habit to put Wet Ones Antibacterial Individually Wrapped Single Wipes in the Lil Divas backpacks and lunch boxes for those unexpected moments and/or messes. 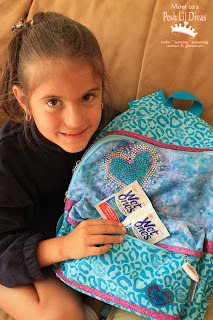 I also send in canisters of Wet Ones Antibacterial Wipes to the Lil Divas classrooms. Think about how many little hands are touching all those computer keyboards, art supplies, headphones doorknobs, desk tops and more. If there is ever a place where Wet Ones are necessary it is in the classroom. Wet Ones kills 99.9% of germs and wipes away dirt. This is perfect for little hands. I prefer Wet Ones wipes because they are hypoallergenic and contain soothing aloe. Hand sanitizers can be harsh on your skin since they contain alcohol. The Littlest Diva suffers from eczema so I have to be very careful with what she uses or it will aggravate her condition. Wet Ones have always been gentle on her skin and that is very important to me because I want to keep her both healthy and comfortable. How do you combat all the school germs with your kids? What tips and tricks do you utilize to keep your children as healthy and germ free as possible? Disclosure: I wrote this review while participating in a blog tour by Mom Central Consulting on behalf of Wet Ones and received a product sample to facilitate my review and a promotional item to thank me for taking the time to participate. We have hand sanitizer everywhere. We do too! Honestly, I detest back to school because I always end up sick from one or both of the girls. This year I am determined to do everything I can to prevent that. Probiotics are a must...helps to improve immune system.